I used a different type of vodka - this is very important. 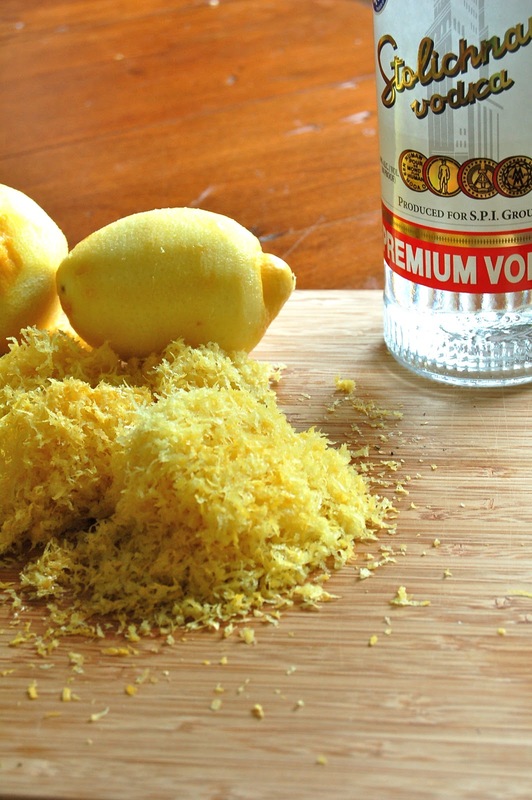 If you don't like the vodka to begin with, then you probably won't like it with lemon and sugar in it either. I switched to Stoli vodka, which is my favorite. I grated the lemons instead of cutting off pieces of peel. My thinking here is that the lemon flavor will be more potent from the zest than slices. I kept the same amount of sugar syrup as with the first batch (after revised). Now the waiting game begins...again. I am only going to wait about 30 days this time instead of 45 - mostly because I am impatient and am craving limoncello! Zest the lemons. You’ll want to zest just to the white pith, but no further. If you do zest any pith, it will taste funky. Add the lemon zest to a large airtight glass container (I use a mason jar while the liqueur sits, but then transfer to a nice bottle for drinking). Pour in the vodka, seal tightly, and let sit for at least one week, preferably longer! (Ideally, give it one to two months.) I usually put this in the back of my pantry...out of site, out of mind! Finally, strain the limoncello using cheesecloth or a coffee filter. It is recommended to do this several times, but I only did once and it turned out fine. Place the container or bottle in the freezer and served chilled.